Basically for hott com 1: you need pin J2-9 (HoTT is using half duplex TX line only) or for com 3: pin J2-10. 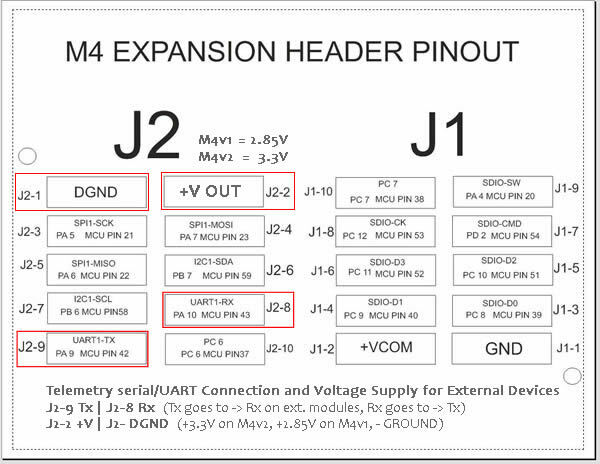 Please note that in most default cases pin J2-10 (PC6) is mapped for using on a PWM line for external esc's. In the case of using a bluetooth module AND HoTT telemetry you need a remapped FW, I use that obviously but that is so depending on the expansion board that one is using that I cant anticipate that right now. Resistors are always a good idea, I have a 100ohm in line. I made this tiny board that only holds com1 and 3 for direct attach of the HoTT receiver. Working great in small frames like the ladybird. kinderkram wrote: Great job as usual, Menno! That´ll make our HoTTies happy. Hope so, there are now so many options that I hope I compiled everything correct although I personally fly the same AQ6 and M4 version with PDB/External esc-quatos and 5 brave testers with AQ6/M4 so I hope everything is working. BTW, if you want the features like WP recording, WP skip, geofence (very handy with small M4's, I have mine on 30 meters so it will not go beyond sight) etc but no HoTT you can simple set TELEMETRY_HOTT to 0 in the params and HoTT is disabled after reboot and will not take up any resources other than space. Last edited by joebar.rc on Thu Jan 08, 2015 2:08 pm, edited 1 time in total. joebar.rc wrote: I made this tiny board that only holds com1 and 3 for direct attach of the HoTT receiver. Working great in small frames like the ladybird. Only problem could be the space to mount the board on a LB frame. A simple plug barely fits in there, adding a pcb would require to either lift the board or turn it upside down. Excellent!! Thanks heaps for this, works a treat on my lady bird frame. Just need to figure out which parameters in quatos to tune to stop the thing twitching. Flashed autoquad_hott_dimu_r445_aq6r1.zip used parameters from last successful flight but motors wont start (KISS wont arm). Same behaviour like when you use a Quatos FW without a license key. Anyone else discovered this issue? I meanwhile asked Srinath for a Key to confirm. EDIT: importing parameters from r429 messed up the MOT_FRAME parameter while MOT_PWRD_ were imported correct? Working now and going testflying. Last edited by teramax on Mon Jan 12, 2015 4:51 pm, edited 3 times in total. It obviously doesn´t save throttle settings and motor mixes. Hmm, did not test import params from older versions on the Aq6 It is basically the repo r445 + extra's. It seems related to the params because I fly the same version as on the download site only with in-compiled params. Will check and report back.. Strange..
Menno, since we now have the possibility only loading portions of the parameters you could offer just the nessecary MOT ones to see if they get stored appropriately. I downloaded a r445 hott from the ftp site, flashed and see if it worked. Did load the r429 param file, see if the throttle, mixing etc are retrieved. Save to perm memory. Removed the power and power back on. Everything what was in the r429 param file was retrieved after the boot, full working r445 with mixing, throttle setting etc. Did do this 3 times, even wend back to a r403 hex file and params from r403 to r445. Al was retrieved saved and kept after reboot. BTW, the motor frame is calculated by the QGCS, so that one I dont have any control over. Is this different than you did experience or test?, I dont see an error on my side so if there is guide me in finding the root cause..
An idea could be to attach a 'faulty' param file so I can test it..